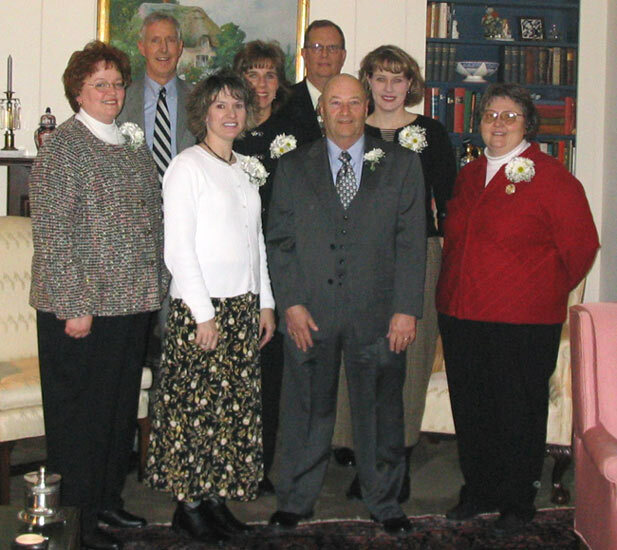 The nominees and the winner of the Chillicothe R-2 District Teacher of the Year award were honored (January 19) at the home of Ed Milbank during the Chillicothe Educational Foundation's annual dinner. Pictured from left: Lisa Gann, Field School second grade teacher; Jane Schmitz, early intervention specialist at Garrison School; Ed Douglas, Chillicothe Education Foundation president; Stephanie Baldwin, learning disabilities teacher at Central School and Chillicothe Middle School; Larry Vance, Teacher of the Year, history teacher at Chillicothe High School; Dale Wallace, R-2 superintendent; Nancy Burtch, math and computer applications teacher at the Grand River Technical School; Betty Sue Radcliff, library media specialist at Dewey, Field and Central Schools. Around $13,000 was raised last (Wednesday) night at the home of Ed Milbank during the Chillicothe Education Foundation's annual dinner. Nearly 100 people attended the event, which set a fund-raising record for the foundation. During the event, the nominees and the winner of the Chillicothe R-2 District Teacher of the Year were recognized including 2004 award recipient Larry Vance, Chillicothe High School American history teacher; Jane Schmitz, early intervention specialist at Garrison School; Lisa Gann, Field School second grade teacher; Betty Sue Radcliff, library media specialist at Dewey, Field and Central Schools; Stephanie Baldwin, learning disabilities instructor at Central and Chillicothe Middle School; and Nancy Burtch, technical math teacher at Grand River Technical School. Ed Douglas, foundation president, made a few brief comments to those gathered and noted that the foundation will award each of the nominees $500 cash and $1,000 for education supplies, equipment and professional development. As the award winner, Vance will receive $1,500 cash and $1,000 for educational expenses. 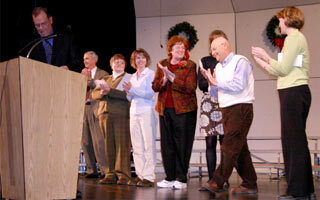 This was the 13th year the district has recognized excellence in the classroom by naming a teacher of the year. It was business as usual this morning (December 7) in Larry Vance's American History class at Chillicothe High School, a day after the instructor was named as the 2004 Teacher of the Year. Vance and five other teachers from around the district were nominated for the award, which comes with a $1,500 cash and $1,000 for educational expenses from the Chillicothe Educational Foundation, the sponsoring organization of the program. The other teachers nominated for the award each received $500 cash and $1,000 for education expenses, also from the foundation. 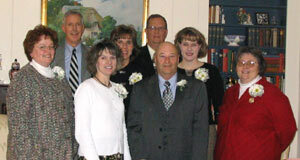 Several R-2 employees and teachers were honored on Monday, December 6, 2004, during the 13th annual Teacher of the Year program held at the Gary Dickinson Performing Arts Center. District Superintendent Dale Wallace served as master of ceremonies and aided by R-2 board president John Marcolla, the two honored several district employees for their years of service. However, the highlight of the half-hour event occurred at the end of the program with the announcement of the 2004 Teacher of the Year. 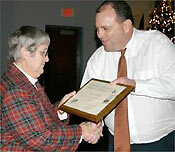 That award went to Larry Vance, high school American history teacher. "What an honor," Vance said shortly after the announcement was made and the accompanying standing ovation subsided. In his brief remarks, Vance thanked the Chillicothe Educational Foundation, which sponsors the Teacher of the Year program, the district's administrators, his fellow colleges and his wife, Margaret, for their combined support. In accepting the award, Vance also spoke briefly about his students. "We've got good kids that come into our classroom everyday with a thirst for learning, and with some encouragement the students can and will learn," Vance said, adding, "Those are the people who earned that award, not me." As the 2004 Teacher of the year, Vance receives $1,500 cash and $1,000 for educational expenses from the Chillicothe Educational Foundation. Ed Douglas, foundation president, made a few brief remarks and handed out awards totaling a combined $10,000 to Vance and the other teachers nominated for the award. "As teachers, you all have an opportunity every day to encourage and make a difference in youth and we applaud you," Douglas said on behalf of the Chillicothe Educational Foundation just prior to the big announcement. Douglas explained that the foundation also works to encourage excellence in education through its Mini Grant program, the administration of several scholarships and the purchase of 60 acres of land near the high school for future growth. 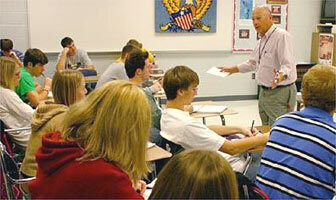 In announcing Vance as the 2004 Teacher of the Year, Wallace explained that the American history teacher possesses three qualities distinguishing him as a great instructor: An extensive knowledge of the subject matter, a compelling desire to share knowledge and discover along with his students "all of the unknowns in the world," and an incredible energy that inspires students to achieve in the classroom and contribute to the community. Many R-2 District employees were honored Monday for their years of service to the district at the Gary Dickinson Performing Arts Center. Among those honored was Bev Davis, Central School library aide, who received a plaque from John Marcolla, R-2 board president, for her 40 years of service to the district.